Unintentional Hilarity: When The Donkey Bursts, Duck : Blog Of The Nation Unintentional Hilarity has a giant sweet tooth. Welcome back to an election week edition of Unintentional Hilarity -- with a photo that's not election related. 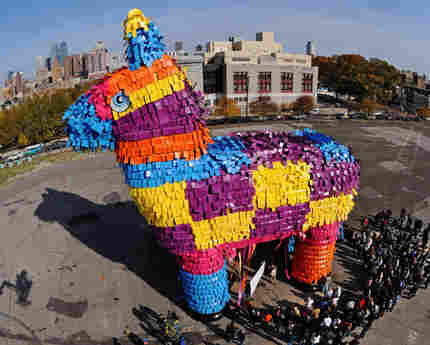 Plus, I suspect that any time a giant pinata is involved, the hilarity is intentional. This is a record-breaking pinata (duh). According to an onsite Guinness adjudicator, the giant mock donkey measures 28.5 meters long; 7.2 meters wide and 18 meters tall and is filled with 8,000 pounds (3,628 kilograms) of candy. Get this: it takes a wrecking ball to get the candy out. I'm all for sweets -- but that sounds painful.